In the current economic climate, everyone is trying to tighten their belts and save money. This is no truer than in industry, as companies look to significantly decrease the operating costs of their factories. Compressed air, the fourth utility, is one of the areas in which many companies are trying to cut back their expenses. A compressed air system that has been properly maintained and regularly serviced will last for many years and represents a sound investment. Unfortunately, in the great race to trim budgets down to size, many are seeking to cut corners and are choosing to replace old and non-working parts in their compressors with non-genuine alternatives. So what’s wrong with non-genuine alternatives? Well, air compressors are complex pieces of equipment made to very specific specifications, the intricacies of which are often kept under lock and key by air compressor manufacturers. While it is possible to create a part such as an oil filter that has the aesthetics of one made by a manufacturer, it’s highly unlikely that a third party would be able to recreate the exact function of a genuine part. Essentially, by using a spare part, you run the risk of hampering the performance of your air compressor. Air compressors are manufactured in order to deliver optimum performance in terms of efficiency and, with regular air compressor servicing using genuine parts, can continue to deliver this level of efficiency for years after the initial performance. By introducing parts not made by the original manufacturer, you run the risk of throwing out this fine balance and compromising the efficiency of your compressed air systems. This could lead to rocketing energy bills and the equipment powered by your compressor performing poorly, both of which will cancel out any savings you may make from buying cheap non-genuine parts. 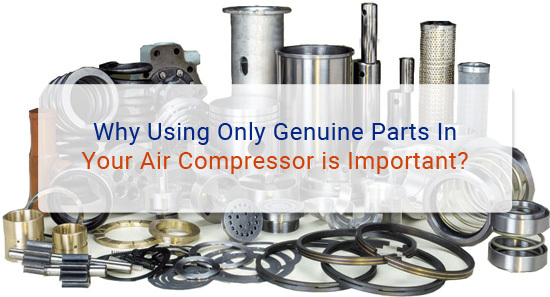 Compressors fitted with non-genuine parts tend to breakdown more often than those with all genuine parts, leading to costly periods of downtime and repairs. Non-genuine parts, while cheaper initially, will inevitably end up costing you more in the long run. However, sometimes non-genuine parts can be installed without the knowledge of the compressor’s owner. Always check that whoever is repairing your compressor uses only genuine parts – and isn’t trying to cut corners themselves! It’s also worth being cautious if you’re planning to invest in a used air compressor, as there is a chance the equipment was fitted with non-genuine parts in the past. Try and get clarification from the seller as to whether this is the case or not. The long and short of this post is that while genuine spare parts are a bit more expensive than non-genuine alternatives, the value they offer in the long run far outweighs the initial cost outlay and should therefore always be your first choice!